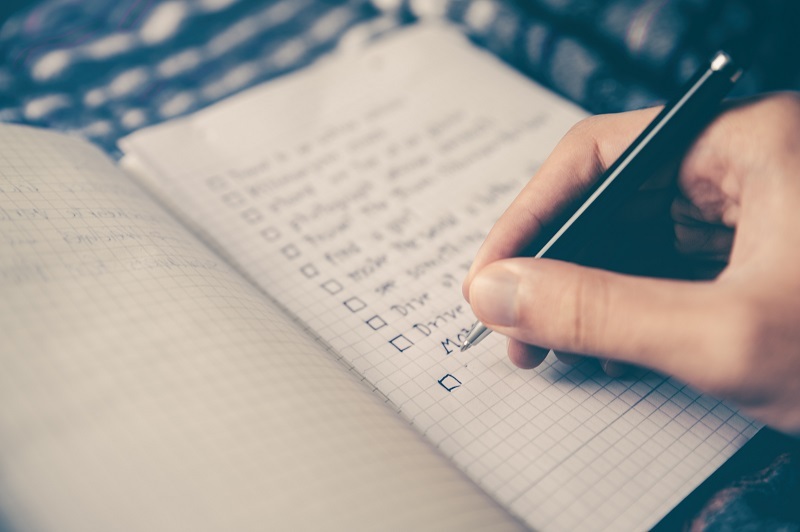 As we close out 2018 and look towards the new year you may be looking to write your 2019 goals. As you plan, look to these four areas of your life and plan ways you can be more intentional in your growth. 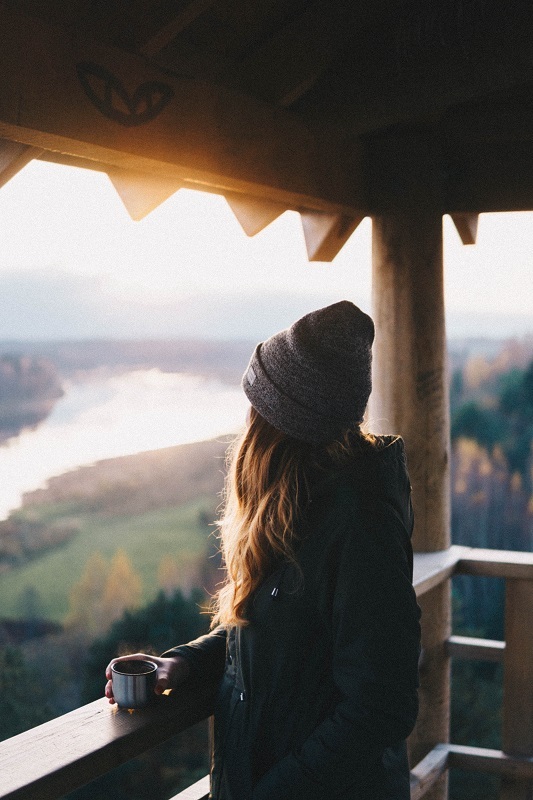 One of the best things I’ve done for myself and my personal growth has been to develop a morning routine. I used to get up at the last minute to get ready for work and would head out the door feeling groggy and rushed. A couple of years ago I decided to be more intentional about how I start my day and it’s made all the difference for me. I show up at work now energized after taking care of myself knowing that I’ve already accomplished some of my most important tasks. Read more about how to make over your mornings here. As you look at your 2019 goals is important to consider who you spend time with. Who are you hanging out with most of the time? Who are your mentors? Make sure you surround yourself with people who stretch you and encourage you to grow. What do you spend your free time doing? Are you doing things that help you reach your goal or are you doing activities that keep you in your comfort zone and stagnant? Evaluate how you will spend your time going forward. What activities will you include that help you reach your goal and what activities will you cut out or decrease? What are you reading? Reading (or listening to audio books) can be one of the best ways to learn and grow. But only if you take action on what you’re learning. Check out the books I’ve read in 2018 here. Listening to podcasts can be another way to learn and take action. The Compound Effect is the principle of reaping huge rewards from a series of small, seemingly insignificant habits. These habits, repeated daily, on a consistent basis don’t seem like much in the moment. But over time, the Compound Effect kicks in and the payoff is amazing. The book The Compound Effect by Darren Hardy is one of my favorites for building good, consistent habits. Check out the book for more details on how to develop each habit. Working on your mindset every day is so important. 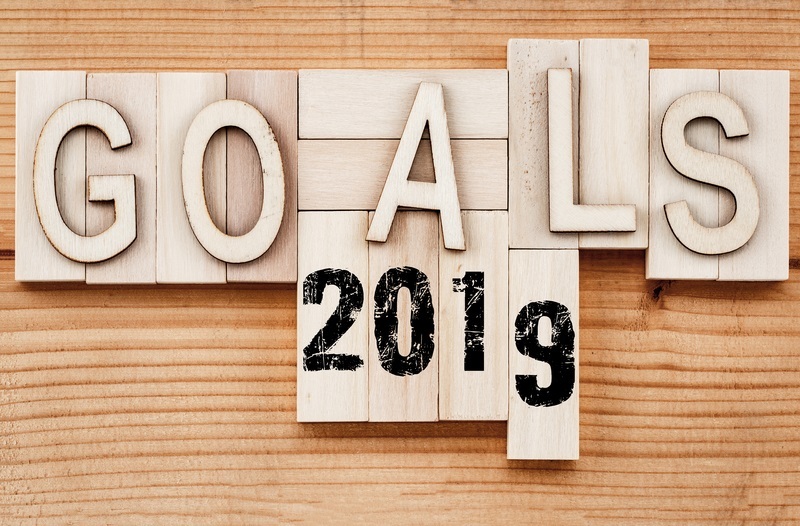 Believing that you can achieve your 2019 goals is a crucial part of your success. Step into the mindset of the person that has hit your goal. What does that person think and do? What decisions would he or she make in each situation? New session starts January 2nd. Urges can be defined as desires that have been habituated. Managing urges can take different forms but one is more effective than others. Sometimes I feel like my brain is like a toddler laying on the floor of the grocery store screaming for candy. This toddler brain got that way because every time I went to the store I got candy. My brain learned that shopping meant sweets. Once I started trying to lose weight my toddler brain still screamed for sweets every time I went shopping. Urges tend come up during certain times, certain events, certain places and even when you are feeling particular emotions (sad, stressed, happy, etc.). Sometimes the urge is for a specific food or type of food – sweet, salty, both. Once you have an urge there are 4 actions you can take: react, resist, distract or observe. 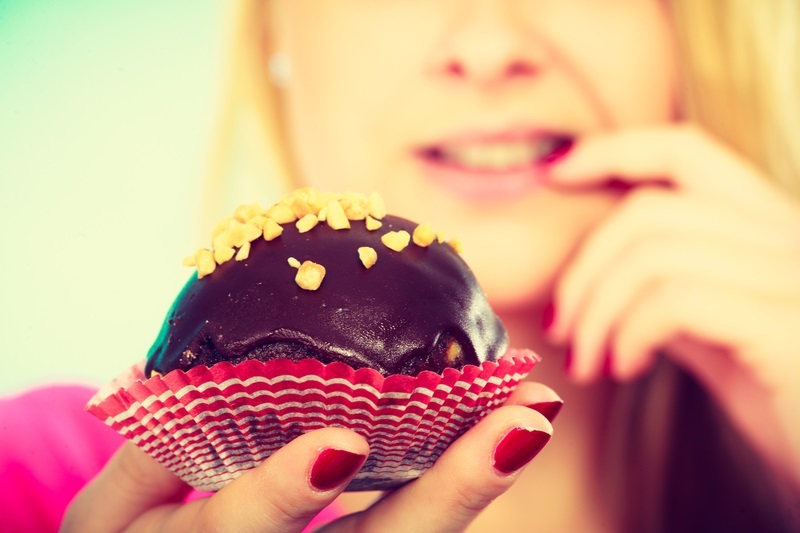 Only one of these actions hold the key to overcoming overeating. Reacting to an urge means you just give in. It fuels the habit and reinforces the habit cycle. The habit becomes even more ingrained over time. Resisting an urge is using willpower to tell yourself no. This is like white-knuckling, gritting your teeth and fighting against it. It takes a great deal of energy and eventually it wears you down. You can’t recognize the habit cycle or learn anything from it when you are resisting. Distracting yourself from an urge is when you busy yourself with something different. You may do other tasks like clean the house or you may decide to avoid certain situations all together. Many people distract themselves with other rewards. So they still give into the urge (and reinforce the urge) but they use something other than what they had the urge for. This is the reason that people gain weight when they are trying to quit smoking. They replace the urge to smoke with food. Observing your urges means to be curious. Take a good look at the urge and allow it to be there without answering it. This action can change everything for you. When you have an urge your toddler brain screams to let you know that it feels terrible. It tells you that resisting pizza (or whatever you are having an urge for) is unbearable. But if you take the time to tune into how your body is actually feeling you realize that you feel restless, or antsy. You realize that your brain is creating a whole lot more drama than you are actually physically feeling. I’ve been good all day. Use this as an opportunity to learn from the experience. To figure out the things that trigger your urges. To learn to sit with the urge and be curious but not give in. Do a thought download. You may be surprised by what you learn. What does your toddler brain say during an urge? Today I want to share with you 3 simple tips I learned from my coach Corinne Crabtree of Phit-n-Phat. Implementing these simple tips can help you break the habit of taking in extra unneeded calories throughout the day. Sometimes we think weight loss is hard and takes drastic measures. There are so many small tweaks you can do that help you make changes you can keep for life. That way you can stop the cycle of dieting, failing and gaining the weight back. Corinne calls these BLTs. If you start tracking it you will see just how often you lick the spoon while cooking, take bites while seasoning food, or finish off the last couple bites of your child’s plate. These are just extra calories that add up without you even realizing it. Sit down when you eat. No eating while standing at the pantry, the counter, or the stove. No standing up and eating while working. Take the time and sit down. It gives you a mental break to evaluate if you are truly hungry or if you are just fog (mindless) eating. 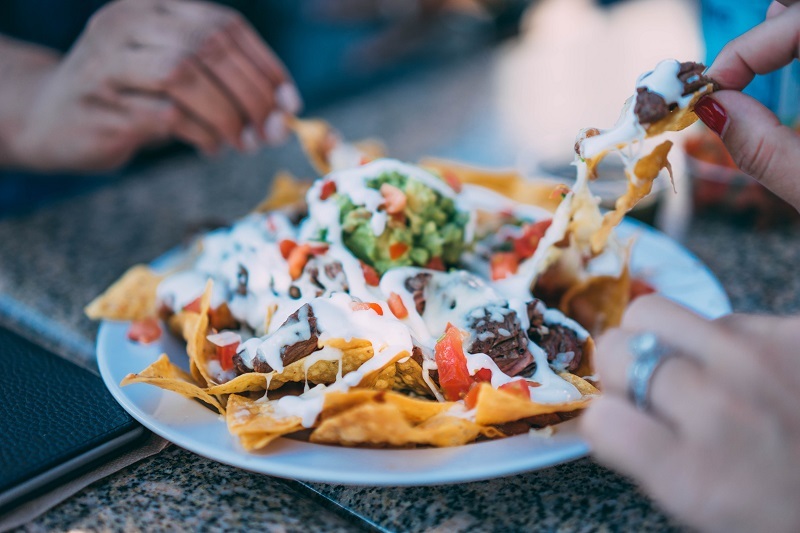 Commit that you will leave 2 or 3 bites behind at every meal. This gets you comfortable with not automatically finishing everything on your plate. Many times you have reached satisfaction but you finish the meal because it’s there. 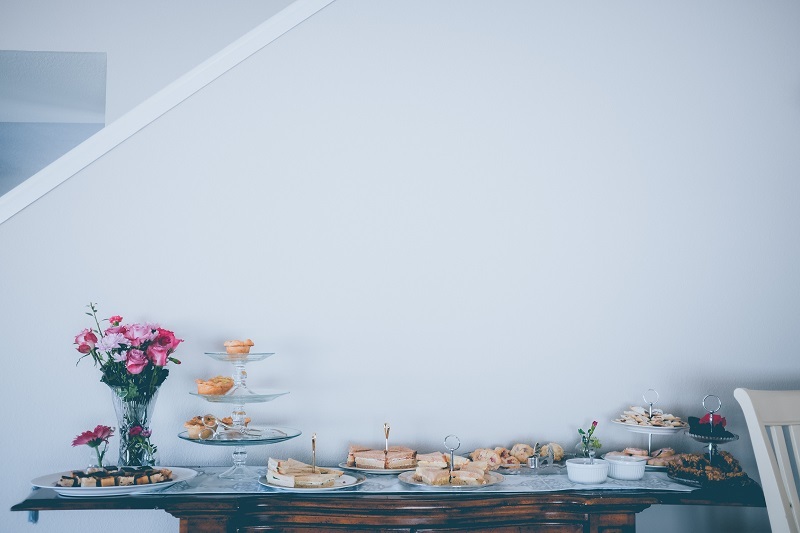 Leaving bites behind can help you eat with more intention – you have to pay attention to how much you’re eating in order to leave the bites. I was taught to clean my plate and not waste food. However the food is still wasted if I eat it and it ends up on my hips. Either way, eating food that my body doesn’t need or throwing out the food it is wasted. Implementing these 3 simple tips can save hundreds of calories a day. This allows your body to access the body fat you have stored so that you can fuel your body and lose the weight. Will you implement any of these tips this week? In a previous post I talked about establishing a habit of doing a thought download each day. Once you start doing this you will begin to notice thoughts that are not helping you. Thoughts that you might wish you could change. Awareness of your thinking is the first step to change negative thinking. In my Bible study I learn that God wants me to “transform by the renewing of my mind” (Romans 12:1-2), to “take my thoughts captive” (2 Corinthians 10:5), and to not “be double-minded” (James 1:8, 4:8). But my old, practiced thoughts keep coming up over and over. My brain has built circuitry to have these negative thoughts come up over and over. It takes awareness and practicing new thoughts in order to change your thinking. Coach Brooke Castillo has developed a practice which I have felt very helpful in evaluating my thinking and taking steps to practice more intentional thinking. She calls it “the model” and it is a simple but powerful tool. It is based on the realization that any problem in life is actually a thought problem and you can always change how you are thinking about a situation. The model is broken down into 5 components: Circumstance, Thought, Feeling, Action and Results (CTFAR). The circumstance is the facts. Facts that anyone can agree on. What is your thought about the circumstance? Choose just one thought. When you have this thought, what feeling does it generate? Your feelings are created by your thoughts. When you are feeling this way, what do you do? What are the results of your actions? Circumstance – I weigh 250 pounds. The circumstance doesn’t change. It’s the same as the unintentional model. We don’t change how we feel by changing our circumstances. We change our feelings by changing our thinking. Thought – I am figuring this out. Thinking that I am figuring this out opens up the possibility in my brain that this can be figured out and brings me hope. Action – I track my food, plan my meals and evaluate if I can “level up” my eating. If I feel hopeful I am more likely to take some steps towards figuring it out. Result – I figure out how to start losing weight. When I take steps I make progress. When I keep thinking the way I’ve always thought I stay the same. If I truly want to change and grow I have to change my thinking. The model has given me a practical way to do just that. This post is a part of a 30 day series for the Ultimate Blogging Challenge. For more in this series click here for the main page with all the links. High Performance Habits by Brendon Burchard has been one of my favorite books of my 2018 Reading Goal Challenge. This is definitely a book that can help you be your best self. Burchard studied high performers for more than ten years to discover why certain people are successful, why some of those successful people are happier than others, and what deliberate habits do the happy, successful people practice. You may be someone who is actively working on building good habits. But which habits can have the most impact? Burchard boils all that he learned into 6 habits: clarity, energy, necessity, productivity, influence and courage. I’ll write a bit about each habit but I encourage you to get the book and read it for yourself. There are great stories to illustrate each point and every section has actionable steps to build better habits in your own life. High performers consciously seek clarity. They ask themselves questions more often. Who do I want to be? How do I want to interact in this relationship or at this meeting? What is meaningful? What is my focus in this moment? What feeling do I want to have and what do I need to think in order to generate that feeling? What’s working and what isn’t? To perform at a higher level you must raise necessity. The driving forces of motivation are both internal and external. Internal forces include your own personal standards of excellence and obsession with your goal. External forces include your social duty or obligation and the urgency of obtaining the goal. One of the ways of increasing productivity is to take a break. It seems counter-intuitive but giving yourself a mental break to focus on a few moments of deep breathing and remembering your focus. Unfortunately I have a bad habit of taking a break and checking social media or email. This causes a sharp decline in my productivity because it’s so easy to get distracted from my goal. Another productivity tip is to figure out what are the outputs that you produce that really matter. Which activities move the needle toward reaching your goal? Do more of those. Burchard talks about breaking down each major goal into five major moves. What are the five moves you could make to rocket you towards your goal? 60% of your time should be devoted to working on those five moves. High performers intentionally develop influence. They teach people how to think about things. They challenge others in the area of character, connections and contributions and encourage them to push farther and to be better. Influencers tend to be role models for others. Influence is the ability to understand other people and get them to act towards objectives. We can have positive influence on others all around us – not just in the workplace. High performers demonstrate courage. Courage is a skill and it can be learned. Understand it and give yourself opportunities to practice it consistently . The more actions you take towards facing your fear the better you get at facing it. Courage, like fear, is contagious. Here’s a quick video where the author describes the 6 habits himself. There’s so much good stuff in here I encourage you to read it for yourself or get the audio. If you’ve read the book I’d love for you to drop a comment down below and tell me what you thought of it. Doing a thought download is a practice that has helped me in so many areas of my life. I started doing it as a practice to stop overeating. But I have learned that is is simply a good practice to help get the jumbled thoughts out of my head. This helps me start my day with some intentional thinking so I can increase the likelihood of meeting the day’s goals. Some people call this practice a brain dump. I find when I am thinking about a problem or a challenge my thoughts get all mixed up with my usual habitual thinking. It’s hard to recognize a problem thought that my brain has turned into an automatic thought pattern. Once I start peeling it all apart and writing it down I can begin to think better thoughts to change the outcomes. Sometimes I am surprised by the thoughts once I get them down on paper. You cannot mess it up. I recommend you do this on paper rather than typing it out. There is something powerful in the connection between your brain and your hand. Start writing whatever’s on your mind. Write for two to three minutes. More if you’re on a roll. Empty out your mind onto the paper. If it’s just not going to happen on paper, you can type your thought downloads. You can start with some prompts to get you started if you feel stuck. Today is going to be a ______ kind of day. Fill in the blank and then begin to write about why you think the day is going to go that way. Is there anything you can do to have a better day? There are some more prompts at the bottom of the post. If you are working on stopping overeating you can write down what you ate yesterday. Are you happy with your choices? Why or why not? Did you struggle with anything in particular? What is your eating plan for today. Are there any challenges you’ll face that you can work through before you get to them? Truly, you can write about anything. Just free write and see what comes. I hope you’ll give this a try and see how things can change if you start your day by clearing out your thoughts on paper. What actions can I take today (or tomorrow) to move me towards my goal? What does self care mean to me? What can I do today that will make me proud of myself? There are 4 types of eating. I have previously covered the concepts of fuel foods and joy foods. The other 2 types of eating are types of overeating. My coach calls them storm eating and fog eating. Other terms for them can be binge eating and mindless eating. One of the two types of overeating is called fog eating. Fog eating is just not paying attention to your eating. It may happen when you are eating while you are distracted – watching TV, working, scrolling on the internet, etc. It may happen when you are taking bites, licks and and little tastes (BLTs) here and there. Tasting little bites while cooking, finishing off your child’s food while cleaning up the kitchen, eating the crumbs from the edge of the cake in the break room. One way I know I’ve been fog eating when feel cheated at the end of the meal. Like I got there so fast I didn’t get to enjoy it. When you become aware of when you are fog eating you stand a chance of making a better choice. This is about choices. You don’t need more willpower. you just need to recognize it and make a choice. Either eat it and realize this choice may delay the result you are going for. Or don’t eat it and learn to sit with the discomfort. It won’t kill you. The other of the two types of overeating is called storm eating. Storm eating is a conscious choice to eat past satiety. There is usually strong emotion tied to storm eating such as anger or justification. It is intentional. Do not give binges power. Do not make them more than they are. You may feel out of control but in reality you are just making a choice to continue. You can make a different choice. The first step to stop overeating is awareness. If you don’t realize you are fog eating or storm eating you will always wonder why you’re not losing weight. Before you can tackle the problem you have to recognize that you are doing it. Start journaling when you have an overeat. Whether it was an intentional storm eat or an unintentional fog eat you can learn from it. The more overeats you recognize the faster you can learn from them. Track the time of day – my hardest times are right when I get home from work and right before bed. Write down triggers – are you tired, bored anxious, stressed? Place – does it happen more at work, at home, on the couch, at the computer? Note anything that you notice surrounding the event. Don’t be afraid of writing this stuff down. 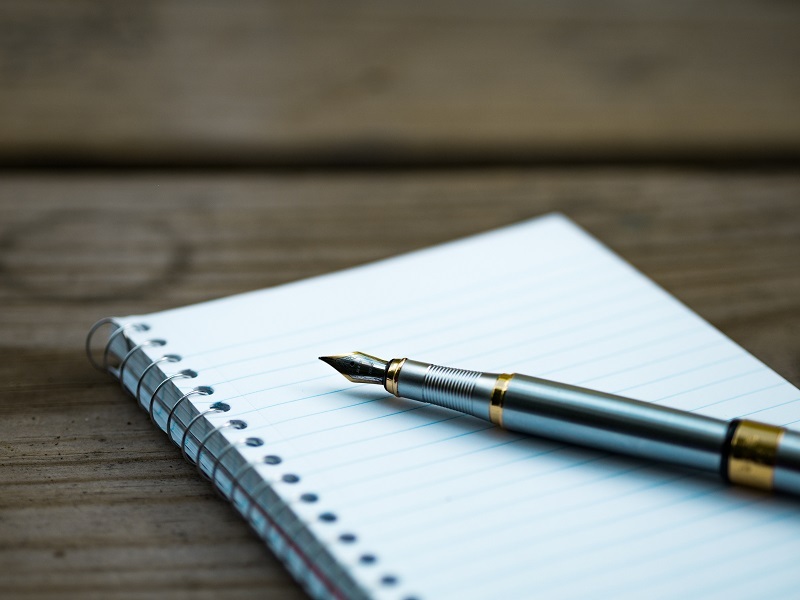 The journaling can cause you a little discomfort in putting all this down on paper. But it can be the tool that helps you figure this all out and get better results for yourself. Grab a journal or a piece of paper and track what you eat today. Pay attention to times you notice that you’re eating when you’re not actually hungry. Write a bit about what you were feeling in those moments. Use it as a time of discovery. This past month or so I have implemented a new practice into my diet routine. I have been planning what my coach calls a Joy Meal. I have been very strict about what I eat for almost a full year now. In fact I wrote a post about why I don’t cheat on my diet. I still practice eating foods that I have learned are best for my body. I have lost 38 pounds and I have a long way to go. But I wanted to learn to practice planning for special foods. I wanted to learn the skill of eating a food that had previously been a problem for me and then getting right back on plan. When I first heard about this practice it made me all sorts of nervous. What if it made me gain weight? What if I totally blew my diet? It made me aware that I still have some work to do related to my thoughts and beliefs about food. I plan my food 24 hours ahead of time. So joy food is not a last minute decision. I can’t just decide to eat pizza when the girls at the office decide to go out at the last minute. It has to be planned 24 hours ahead of time. I only have one joy meal per week. I think long and hard about what I want for my joy food. It’s funny, I used to love sweets so much. But since I have stayed away from sugar for a year I crave savory foods for my joy food. My most recent joy meals have included nachos and pizza. I have a joy meal every week. This gives me practice once a week with sticking to my plan, practicing constraint, and getting back on plan. I still eat to a +2 on my hunger scale. This is not an excuse to overeat and stuff myself. I don’t have to feel deprived. For example, one of my favorite desserts is cheesecake. Today at a meeting they served the most beautiful piece of cheesecake. I didn’t plan for it so I didn’t have any. But I don’t have to feel sorry for myself or feel like I can never have cheesecake like everyone else. I can plan for it on another day and enjoy the heck out of it without shame or guilt. The funny thing is, now that it’s not in front of me I don’t want it. I’d rather have nachos this week. I am proud of myself for planning and following my plans. I’m proud of myself for making better choices to show up as my best self. I can still lose weight while having a weekly joy eat. I can eat delicious foods and stop before overeating. I can be intentional about my food life. It doesn’t control me. I can always make choices. It’s easier to stick to my daily plans when I have a joy meal to look forward to. It’s easier to say no to donuts in the break room at work when I know that I’m having something special later in the week. Fuel foods provide your body with nutrients. They give your body energy. Fresh foods that are less processed are great choices. 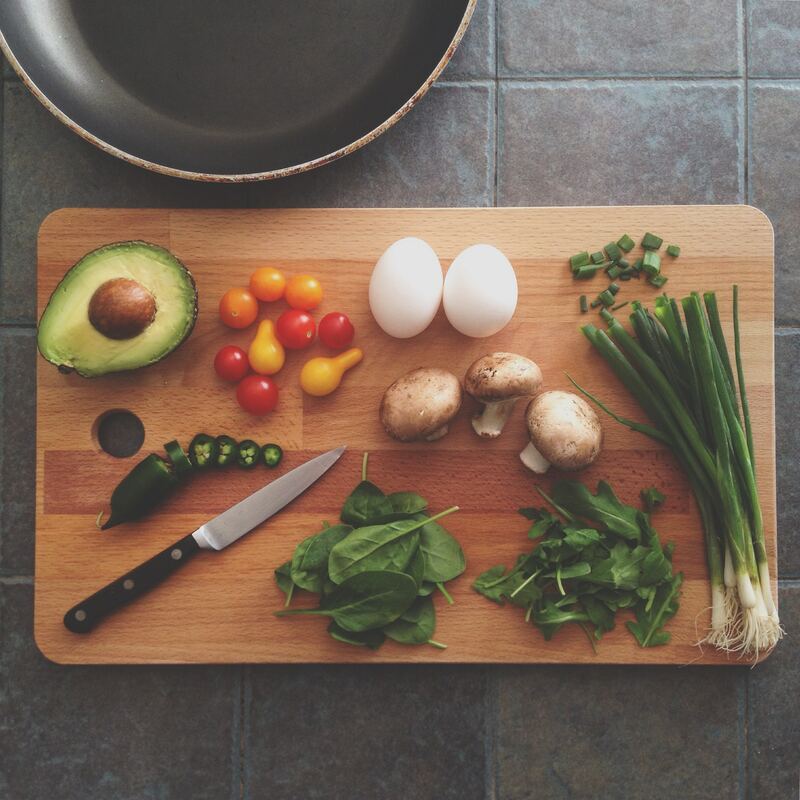 When you are planning what you will include in your nutrition plan look for foods that are less processed, full of nutrients, and provide you with energy instead of making you feel sluggish. Pay attention if what you eat makes you sleepy within a few hours. Look for foods that you can’t resist overeating and evaluate if there is a better choice. Start adding more of these nutritious foods into your plan. Plan realistically and stick to your plan. Don’t make it complicated. As you go along you can level up your eating plan. As you learn which foods don’t make you feel your best you can begin to make better choices. If there are foods that tend to cause you to overeat you can look at swapping it out for a better choice. As you progress in your weight loss journey you can continue to level up your foods to more nutritious choices. 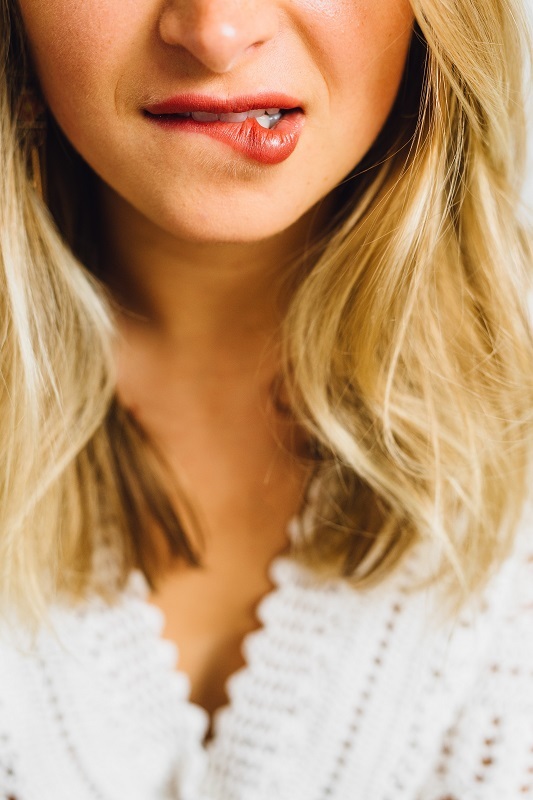 As you do this you will notice that your taste buds will change to enjoy the healthier foods. You will have more energy and you will feel more satisfied. Look at what you ate over the last week. Are there foods that you could swap out this next week to help you get to your weight loss goal? The hunger scale is a useful tool to help become more aware of the body’s signals for fuel. Once I started practicing using a hunger scale I realized how many times I was eating just because I felt like it was time to eat. I realized how often I had habits of putting bites in my mouth when I wasn’t hungry at all. A piece of cheese while waiting for dinner to be ready, a handful of nuts before bedtime, a morning snack when I was bored at work. Cleaning my plate even though I was full. It all adds up. Using the hunger scale can help you tune back into your body’s needs. It’s a way to eat when you get a little hungry and stop when your satisfied but not full. If you have fat to lose you have stored calories on your body. Allowing yourself to get a little hungry before you eat allows your body to tap into those fat stores and use them for energy. When you eat every two or three hours you don’t allow your body to use up those energy resources. There are many different versions of hunger scales you can find on the internet. This one is how I think of my own hunger scale. Start listening to your own body’s signals. What does a -2 feel like for you? How does your body feel when you are satisfied at a +2 but not full. Journaling this at each meal can be helpful. The more you practice the sooner you will find the sweet spot. Your goal is to stop at satisfied. Satisfied is where your body is telling you it has had enough. I spent years thinking I needed to get to full each meal. This one tweak – stopping at satisfied – helped me break a months long plateau and has continued to help me make good choices. When this is dialed in you will have more and more opportunities where you do not overeat. Be prepared to leave food behind. It’s OK to not eat the last few bites if you are satisfied. Even if it’s broccoli. Using this tool can help you learn to stop when having a treat. It can help you learn not to overeat when out to dinner. Some of the physical signs of “satisfied” I noticed were subtle. I tend to sigh when I am approaching satisfied. If I pay attention and stop a few bites later I find that it is perfect. If I am moving past “satisfied” I start picking out the good parts of my food. That’s a good signal from my body that I am no longer eating for fuel but for entertainment. It takes a while to get it dialed in. 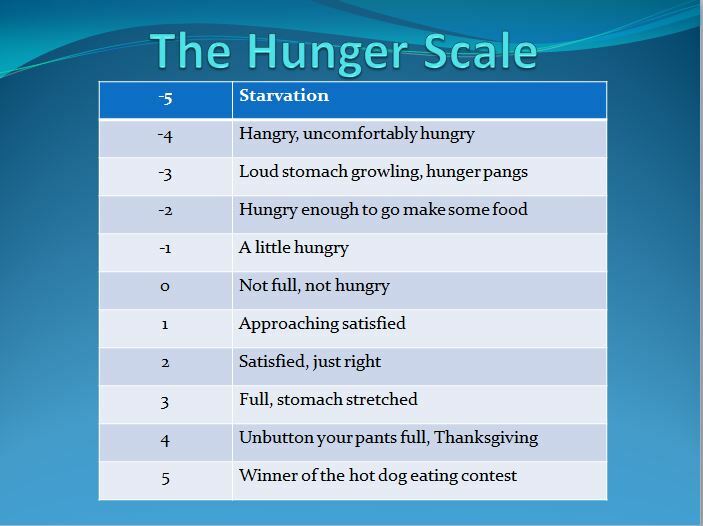 Feel free to comment below with any questions you might have about the hunger scale. This post is a part of a 30 day series for the Ultimate Blogging Challenge. For more topics like this click here for the main page with all the links.